The way the Yankees are going to try to win their 28th World Championship is the same way they won 97 games during the regular season and really the same way they've won ever since Joe Girardi got here: Get an average or above average outing from your starting pitcher, trust your bullpen, take take take pitches all game, wear down whomever you're facing, wait until they finally run out of steam ... and then destroy them. The waiting is the key part: Eventually, the Yankees perpetual lineup will get you. Only a matter of when. Though, to be fair, it's rare it takes two days. The Yankees did what the Yankees do, winning Game One of the ALDS over the Detroit Tigers 9-3 in a game that was closer than that until it loudly, definitively, wasn't. The Yankees struggled early against Justin Verlander replacement Doug Fister, blowing a scoring opportunity in the second inning -- thanks to a baserunning error by Jorge Posada that you wouldn't see a rookie make -- and then not reaching base again until there were two outs in the fifth. The Yankees scratched out a run that inning, on an almost-homer by Robinson Cano that scored Curtis Granderson, and you could see Fister about to crack. The next inning, he finally did. The Yankees scored two in the sixth and finally pushed Fister out with the bases loaded, bringing in the wonderfully named Al Alburquerque. Perhaps distracted by the violent drug war between Gus Fring and the Mexican cartel waging inside of him, Alburquerque promptly gave up a grand slam to Cano, and the game was basically over. 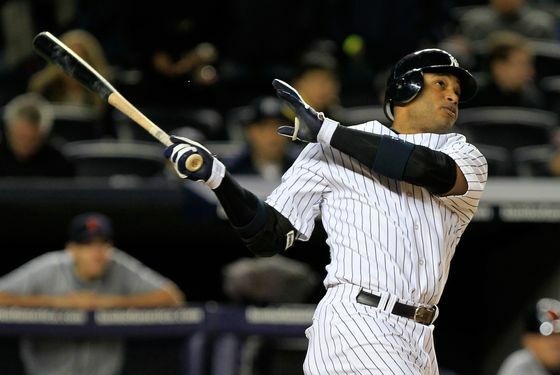 By the way: Cano, who had six RBIs, fits awfully perfect in that No. 3 spot, doesn't he? He hit there seven times during the regular season, and with Detroit throwing righthanders the entire series, you wonder if he'll ever give it up. Ourselves, we're still sort of recovering from the vertigo of a suspended game; it's odd to resume a baseball game after a 22-hour delay. The Yankees cherish tradition over all else at their billion-dollar ballpark that is three years old, and it was amusing to watch them try to figure out which of their customs to honor amidst this bizarre suspended animation. For example, there was no honorary first pitch, but lineups were announced. The Bleacher Creatures chanted the names of each Yankee on the field as usual, but they had to wait for the Tigers to get off the field first. (Extremely strange to see a Yankee game begin with the opposing team running on the field.) Perhaps most disorienting of all: For what has to be the first time in the history of any Yankee Stadium, the national anthem was not played before first pitch. Why do the Yankees hate America? It's a quick turnaround for Game Two. The game begins at 3 p.m. tomorrow so both teams can fly to Detroit afterward, with Freddy Garcia facing the Tigers' Max Scherzer. The turnaround isn't that quick, though. Tonight, Major League Baseball and TBS finally figured out a way to finish a Yankee Stadium postseason game before midnight: Start it in the bottom of the second inning.